By the next morning, the airwaves were abuzz with debate about the bus ads. One radio station, 1310 News, posted a survey on its website that asked readers, “Should the ads from ‘ReThink911’ be allowed on OC Transpo buses?” More than 90% responded “yes.” By later that morning, articles on Yahoo News and Huffington Post also mentioned the ads in Toronto and Vancouver. The Huffington Post was the most senselessly derisive, cherry picking the tweets of two angry onlookers who described a country in “outrage.” Yahoo News was much more balanced in its coverage. 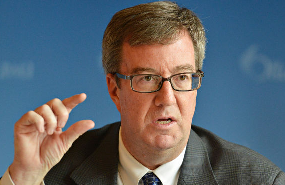 Ottawa Mayor Jim Watson: "At the end of the day [the ads] met the Advertising Standards Council's standards and they are allowed on the buses... Free speech is an important principle in our society." Early in the afternoon, the ReThink911 campaign released a statement defending the right to run the ads and countering claims of “insensitivity,” noting that the campaign is supported by many family members of 9/11 victims. The statement was quickly picked up by the CBC, Ottawa Citizen, and Sun News, which also quoted Ottawa’s mayor, who called the ads “disrespectful” but noted that they are protected by free speech. The following day, an Ottawa Citizen editorial suggested that the Ottawa Transit Commission should err on the side of free speech, affirming that the ReThink911 ads are indeed protected under the Canadian Charter of Rights and Freedoms. City Councilor Diane Deans had planned to request a review of Ottawa’s advertising policy at the Transit Commission’s monthly meeting on September 18. Supporters of ReThink911 in Ottawa assembled to oppose any action that would curtail free speech on Ottawa’s buses. However, a tragic accident involving a bus and train occurred an hour before the meeting, and it was cancelled. In response to the controversy, ReThink911 commissioned the polling firm YouGov to conduct a national survey. The results, released a week after the criticism appeared, showed that a majority of Canadians actually sided with ReThink911 in questioning the cause of Building 7’s collapse, which contradicted most of the news coverage. After viewing video footage of Building 7’s collapse, 51% of those surveyed suspect that its collapse was caused by controlled demolition, compared to just 18% who suspect it was caused by fires. By a clear 3-to-1 margin, 44% support a new investigation into Building 7’s collapse, compared to just 13% who are opposed. With regard to Ottawa’s advertising policy, 54% believe it correctly protects freedom of speech under the Canadian Charter of Rights and Freedoms, while only 19% think it should be revised to disallow ads like ReThink911’s. According to the Ottawa City Clerk, Councilor Deans still intends to enter a motion at the Transit Commission’s next meeting on October 16, and the item will be discussed at the following Transit Commission meeting on November 20. After all the momentum that was gained in Ottawa, ReThink911 has big plans for Canada in the coming months. Stay tuned! We still win... We get more free Press. TomT on Mon, 10/14/2013 - 11:30am. 1) look at these crazy truthers--what a bunch of kooks! I'm glad that they have a third framing available. Ace Acme on Mon, 10/14/2013 - 8:09pm.